Harmony House Publishers - Louisville. Copyright 1999 William P Mangum. ISBN 1-56469-037-7. Hard Bound with Dust Jacket. xv/272 pages (includes Index). 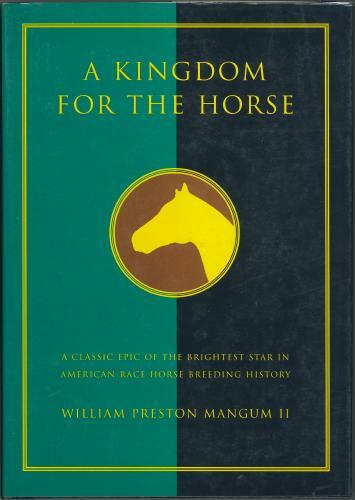 Throughout the pages of this book, the author carefully relates the influence of Woodburn Farm and its owner, R A Alexander, on the equine industry worldwide. The following is taken from the Foreword: "Dedicated to both the craft and science of producing the finest thoroughbred and standardbred horses possible, R A Alexander devoted his life from 1854 until his death in 1867 to the accurate recording of pedigrees. He focused upon the recognition of enduring qualities of both sires and broodmares. ... Nowhere is this better demonstrated than in the phenomenal successes he achieved by breeding his champion stallion, Lexington, to broodmares sired by Glencoe. ..."
Several pages also describe the impact of the Civil War and the guerilla raids on on Woodburn Farm and other Kentucky horse breeders. The author includes many historic and current photos or illustrations of people (for example, Frank James, William C Quantrill) and locations (e.g., Woodburn House, Stonewall House, Airdrie Farm) that are part of the impressive story of R A Alexander and Woodburn Farm. Numerous photos or engravings of horses who were bred at Woodburn or were otherwise related to Woodburn are included within the pages, including Alix, Jay-Eye-See, Nancy Hanks, Maud S, Harold, Swigert, and others. The book has black, textured boards with gilt markings on the front cover and the spine. The book is in Excellent condition with barely noticeable wear at the edges of the dust jacket. The pages are clean and smooth (sample pages shown below). "John Harper who owned Nantura Farm, pictured with his great racehorse, Longfellow; Bobbie Swim up...."
"Advertisement from The Chicago Tribune announcing Jay-Eye-See trying to beat the trotting record." and "The great trotting world's champion Jay-Eye-See, 2:10 bred and foaled at Woodburn Farm."